Ellie James is a dreamer. She dreams of horses - all day long. She dreams of owning a horse, she dreams of owning a beautiful black stallion and she dreams of showing her amazing stallion at the Hamilton Royal Horse Show. And she doesn't just show her stallion, but the crowds scream for the pair, the judge can't take his eyes off of them, and Ellie and her horse win their class! The problem is, Ellie does much of her daydreaming at school, during class. Miss Hernandez, one of Ellie's fourth grade teachers, has had just about enough of Ellie's daydreaming. When will the girl stop dreaming and start paying attention? One day during class, after being reprimanded yet again by Miss Hernandez, Ellie is once more daydreaming. She's looking out the window, imagining her stallion jumping over a big sign when suddenly, Ellie spots a REAL horse. She cries out to her teacher, telling her, and the whole class, that she just saw a horse. The other kids laugh and Miss Hernandez decides it's time to call in Ellie's parents. This daydreaming has to stop. Poor Ellie. Nobody believes her. But she knows she saw a horse, and unlike the horse of her dreams, this horse was skinny, wobbly, and looked frightened. When Ellie's mom comes home from work and explains to the family about the horse that got away from her at the cat rescue - yes, the cat rescue - a horse that matches the description of the horse Ellie saw, she is finally believed. But what will become of that frightened, half-starved horse? Will Ellie be able to save the mare, and more importantly, will she ever get her OWN horse? 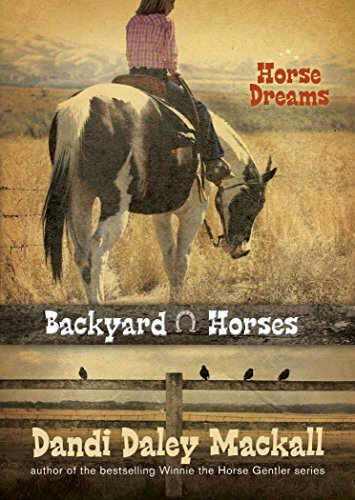 Horse Dreams is a sweet, Christian story of a girl who desperately wants her own horse. Told in the first person by Ellie, she tells the reader of the ways she will try to get her own horse; "begging, crying, and praying." When the first two don't work, Ellie turns to God and asks Him to help. There are some interesting talks that Ellie has with God when she admits, "there's a lot about praying that I don't understand," (pg. 69) such as when two people pray for opposite things - how does God know what to do? And if God can do anything, why hasn't he given her a horse? These questions will make young readers realize they are not the only ones with questions. There is a nice, easy flow to the narrative that will make it fun for pre-teens to read as Ellie takes them along for the ride. Quill says: A nice, wholesome horse story that will keep young horse lovers engaged and turning the pages to see if dreams really do come true.